For three days attendees from all over the country converged on PenFed Credit Union's HQ in Tysons Corner, VA. Builders, thinkers, and doers got together in an effort to build solutions that would solve problems for people in the military community. The weather was perfect, the venue was ready, and everything was in place to host what had become the first VetHacks ever. 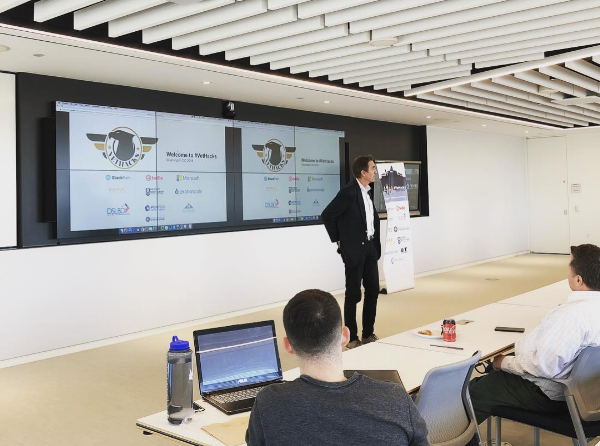 The event, a collaboration between Operation Code, Patriot Boot Camp, and Bunker Labs, brought people together from outside the military spouse and veteran community to build awareness within the tech community. Matthew Collier, VP of Business Development at PenFed makes opening remarks to VetHacks attendees. Five teams focused on issues ranging from PCS to how to build a better transition assistance program and spent the weekend building sites and apps as quickly and efficiently as they could. The event culminated in a demo pitch event where each team had five minutes to present their ideas, why the world needed their solution, and how they would execute beyond just the hackathon. When the dust settled only one stood as the clear winner. Congrats to PCS FOLDER! Aside from winning the VetHacks hackathon, they received the very first invitation to the next Patriot Boot Camp program happening in Denver CO later this year. PCS Folder (right) with judges Emily McMahan (Bunker Labs), Justin Johnson (Stackpath), and Josh Carter (Patriot Boot Camp) left.